September 05, 2018, 5:00 p.m. The nomination of Brett Kavanaugh to the US Supreme Court reflects the partisan divide, as Republicans rally around Donald Trump’s second Court nominee, who is now facing his Senate confirmation hearings. Democrats, on the other side, want their Senators to do more to oppose the nomination, even though they don’t have the votes to stop it. 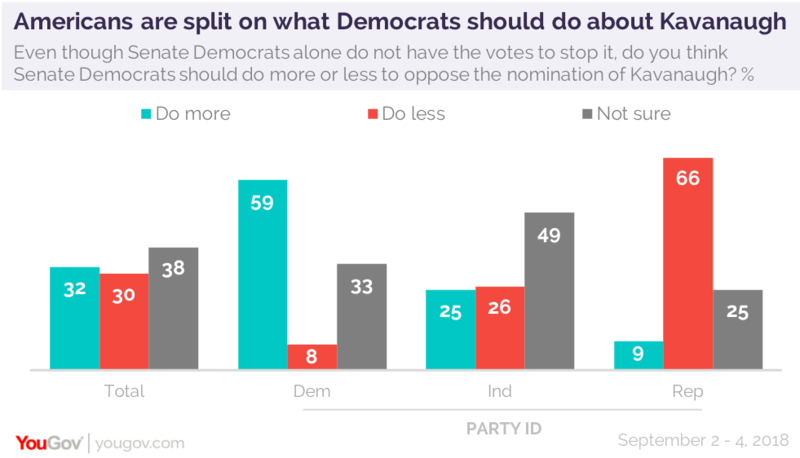 This is clear in the latest Economist/YouGov Poll in the split on whether or not Kavanaugh should be confirmed: in the last week Democrats and Republicans have moved away from each other on the question, and independents are now divided. Last week, independents with an opinion favored Kavanaugh’s confirmation. Now just about as many oppose his confirmation as support it. However, independents (as well as Americans overall) believe that Kavanaugh is qualified for the job. By two to one, Democrats disagree. About one in ten Americans (and two in ten Democrats) expect that Roe vs. Wade, the 1971 Supreme Court decision that legalized most abortions, will be overturned if Kavanaugh is confirmed. Those who think this oppose Kavanaugh’s confirmation by two to one. Four in ten overall say the odds are fifty-fifty that the abortion decision would be overturned. This group also opposes Kavanaugh’s confirmation. But nearly half the public believes the overturn of Roe v. Wade is unlikely. This group supports Kavanaugh’s confirmation two to one. It is worth noting that opinion about abortion continues to divide the country, although most want to keep at least some abortions legal. A majority of 56% say all or most abortions should be legal. Just under a third, 31%, would outlaw most abortions, but still keep some legal. Just 13% overall (24% of Republicans) would make all abortions illegal. Democrats want their Senators to do more when it comes to opposing Kavanaugh, even when reminded that Democrats don’t have the votes to reject his nomination. Nearly six in ten want to see more opposition. Republicans take the opposite view. Independents are divided on this, just as they are on their opinion of whether or not Kavanaugh should be confirmed.